K9 Global Training Academy’s detection dogs are utilized by both police and military forces, as well as private industry and individual property owners from across the Unites States and around the world. By honing each dog’s natural senses to focus in on items such as land mines, drugs, bombs, and even substances commonly used in arson cases, we are able to not only create a more efficient working environment for you and your team, but also a safer one. Whether for professional or personal use, there is simply no replacement for top quality training techniques, and with K9 Global Training Academy’s longstanding history within the industry, you can rest assured knowing that top quality training is exactly what your dog will receive. 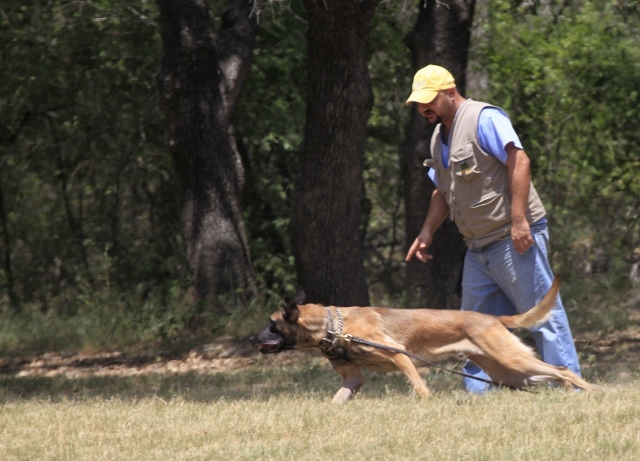 From the first day a dog arrives at our training facility in Somerset, Texas, it becomes part of the most thorough and rigorous K9dog training program on the planet. With more than 25 years of experience training sniffer detection dogs, our experts have quite literally set the bar for training k9 dogs in the field of detection work. When K9 Global Training Academy began in 1984, there were no recognized standards within the industry. But now, more than a quarter century later, our standards are not only recognized, but have been implemented by professional trainers in nearly every corner of the globe. Many of our dogs are trained for general purposes, but we also offer a wide variety of highly specialized training options as well. All of our dogs are screened in advance of entering our special international training program, with only the finest animals being selected. Because of this highly scrutinized process, we are able to guarantee our customers the absolute finest quality dogs available. Over the course of our existence, we have seen a significant spike in the demand for certain types of training. For example, in the United States and around the world, there are currently more drug dogs in use than ever before. K9 detection dogs have also become a staple on the field of battle, as military use in the detection of bombs and other explosive devices has also skyrocketed in recent years. These detection dogs are not only more efficient than previous methods of detection, but they also provide a security buffer for their human co-workers that is literally immeasurable in dollar value. Not only are these dogs a finely tuned tool of the trade, they are also fearless companions capable of protecting and even saving human lives. Global Training Academy delivers only the absolute highest quality in professionally trained detection dogs. Because of our rigid quality standards and upstanding reputation, we are happy to stand behind each and every dog we deliver, regardless of its specific training focus. Not only do we offer top-notch follow up support, but we are also proud to offer a full year guarantee on every dog we train. If, for any reason, your dog does not meet the high standards you have come to expect from Global Training Academy, we will be happy to either retrain or replace the dog to ensure your happiness.